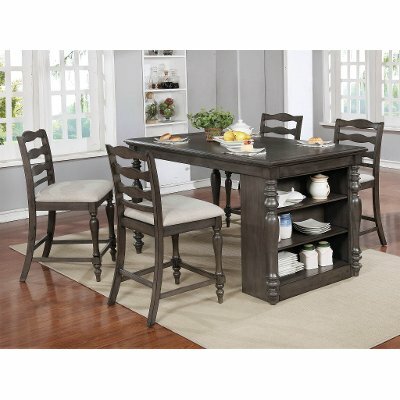 This unique birch gray 5 piece counter height dining set from RC Willey features an innovative yet classic design that combines style and storage and it would look incredible in your dining room. You'll love the extra storage space provided by the side shelf area and the convenience of the built-in USB plug in the table. The counter height stools feature several classic French details and are both traditional and timeless in their design. This unique birch gray counter height table from RC Willey features an innovative design that combines style and storage and it would look incredible in your dining room! With high-quality construction and classic turned legs, this dining table is sure to stand out. You'll love the extra storage space provided by the side shelf area and the convenience of the built-in USB plug in the table. 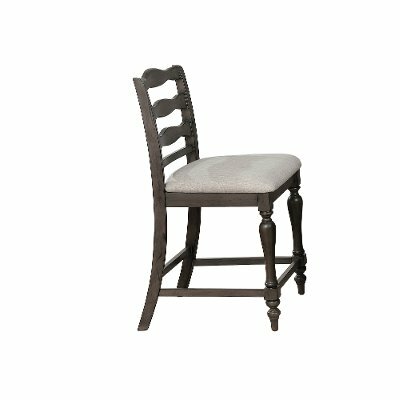 This birch gray upholstered counter height stool from RC Willey is a stunning piece that features several classic French details and is sure to add a charming touch to your dining room. With its stretchers, saber legs, turned front legs, and scalloped ladder back this chair is traditional in its style and is a timeless beauty.